Over the holiday break this year while I was down with some indefinable malaise – who can really tell what is flu and what is cold? Especially if it moves into bronchitis? Too sick to do much, I did find focus and drew energy from reviewing thousands of images that I have taken over the years. I’ve come to understand the lion’s share of work with camera as my contemplative photography practice. A subset of images within this practice contain the presence of the WayMaking Cairn (WMC); an avatar-like manifestation of my spiritual engagement with my surroundings as I walk. In anthropological terms the WMC serves as both witness and subject in the environment where I framed and took the shot. #’s 1 & 2 are only the tip of the iceberg in terms of cost because applying to the various galleries also costs time and money – one spends a lot of time combing the internet for opportunities. 98% of the time to apply to be in an exhibit or show requires an entrance fees of $20 – $40 for the privilege to submit 3 – 5 images for the curator’s review. Those who are early in their practice are pretty much confined to group shows in pop up or non-traditional sites. Opportunities for solo shows in accredited galleries are slim and none. There are a few more opportunities to get a solo show in a coffee shop, or a bank or a clinic, but those require a lot of prospecting and the possibility of sales from these personally curated shows are not significant. THERE’s MORE THAN ONE WAY TO…. As I pondered these things and weighed their costs against my limited resources of time and money, I wondered how I might get my work in front of peoples eye’s without a gallery, group show or retail outlet. Challenge: How to get my work to a place where they would see it all the time? Where they might also have a chance for a contemplative experience? I couldn’t afford printing, framing and shipping complimentary full size 16 x 20 images to their home. Plus, giving it away sets a very bad precedent. I need to at least cover the costs of that printing/framing/packing/shipping exercise. How to get my work tangibly present in their homes and offices? Though I love the digital world for its reach – its getting too noisy out here and there’s too many distractions. Attention to one’s work on a website and blog is fleeting. The tangible, physical artifact seemed the strongest way in. So, I determined to design and print my own calendar of images. This way each month there would be a fresh image and opportunity for a contemplative encounter for the onlooker. Publish a limited edition of these calendars and give them to family, friends and prospective clients as a loss leader, if you will. An audience that includes potential buyers of future calendars, as well as organizations that might commission the design of special interest calendars, and outlets where I might place my own calendars for sale. This calendar becomes a liberation and expansion of my artist’s role: I have curated my own exhibit for each calendar recipient. This also sets the stage for the next phase of creating a way for these and other of my images to be purchased online. I also hope to design each year a new calendar which can be ordered on line as well. A survey will be sent soon to all who received those calendars to get a sense of how to think about next year’s design and how to price it. Along the way though, another idea came to mind, springing from my love of poetry and poetic prose. 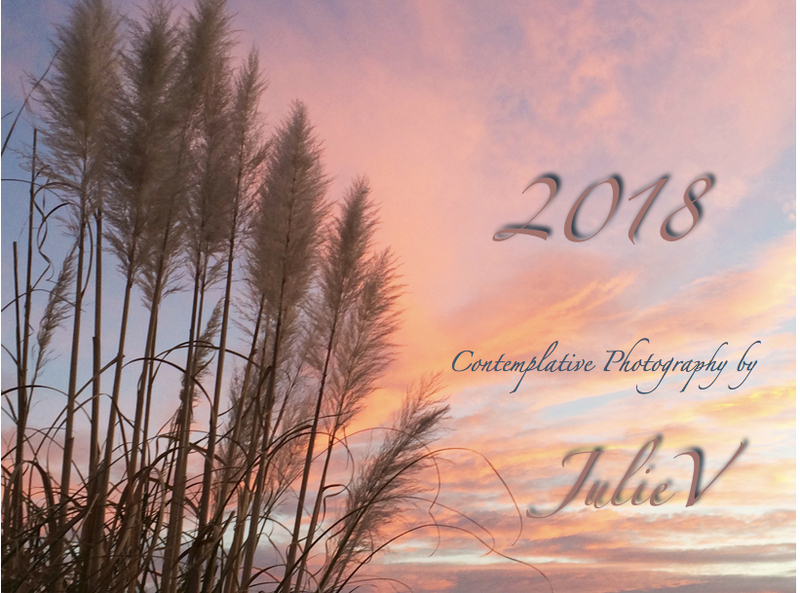 Though not a novel practice – many other calendars have been printed pairing evocative imagery and writing – I welcomed the additional exploration and discovery to pair my images with text that in some way created a rich dialogue of deepening discovery between word and image. While I made every effort to look for writers’ whose work was in the public domain, occasionally a contemporary writer’s work was so perfectly aligned with my own spiritual stance that I could not look any further. This is a challenge and an opportunity for future calendars. I’m a little late in this first explanatory post of the what and why of the calendar and hopes for future calendars. The next two posts will serve as catch-ups for the January and February images and text. At the beginning of each subsequent month I’ll post another image and the literary work that appealed to me.